Parramatta City Council conducted a design competition for the creation of the ARC Precinct to form a new cultural and commercial focus for social interaction and creativity for the city. Revitalisation of this historic section of Parramatta River would create a vibrant new urban precinct through the blending of art and commerce as a welcome addition to the urban fabric of the CBD. Corkery Consulting design concept provided for the Precinct to be energised by a new riverfront pedestrian promenade incorporating restaurants and commercial activities with views across the restored lagoon. Located at the intersection of pedestrian paths and commercial activities, and incorporating a program of public art, the Precinct would provide an engaging place for the exchange of ideas through social and business interactions. The design concept would strengthen the commercial viability of the restaurants and shops by creating a clear pedestrian connection to outdoor eating along Church St., the Riverside Theatre and the proposed north-south pedestrian lane linking Phillip St. to the riverfront. 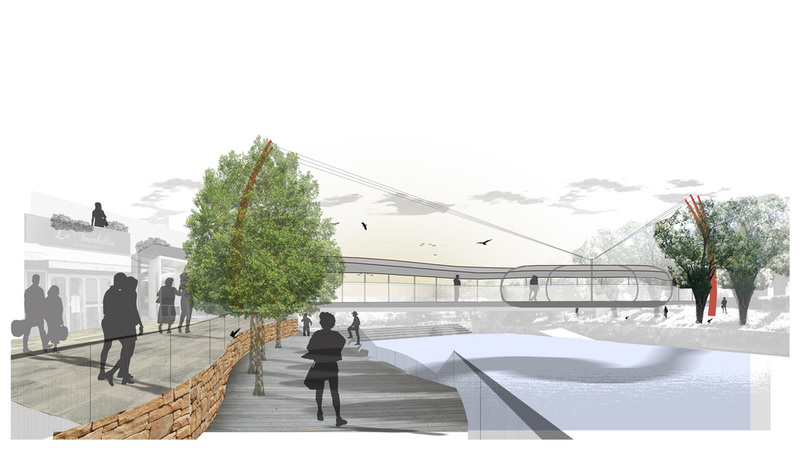 visually and physically connected to the Riverside Theatre via a new landmark pedestrian bridge providing access across the lagoon bounded by Lennox Bridge and Marsden St. Weir. Sustainability initiatives would focus on restoring water quality in the lagoon so it forms the central focus to the Precinct and a water forecourt on the western edge of Parramatta. Residential apartments above commercial space in the western part of the Precinct would provide a distinctive life style with views along the River to Parramatta Park. Flexibility in the commercial and residential development would be achieved through staged implementation that adapts to changing economic and social circumstances.